Spring and Summer bring great weather for us to enjoy and with great weather, comes enjoying the great outdoors. But if you’re not one for bug spray, mastering the art of tent-building, or nature’s unexpected surprises, you might just want your next camping trip to be a glamping trip. Glamping is where beautiful nature meets modern luxury. It’s a way to experience the unruly and completely unique parts of the wild outdoors—without having to sacrifice your everyday comfort. Take your adventure to the next level all while enjoying a stylish and air-conditioned refuge. Glamping.com says, “the glamping movement is growing, and it’s showing no signs of slowing down. Across the globe, you’ll find incredible destinations, each offering their own unique advantages. You can wake up in a yurt on a mountaintop. Reside in the forest canopy in a treehouse. Take in the panoramic views in an eco-lodge. And that’s just to name a few.” So how much does a glamping trip cost anyways? Although you can choose to go glamping in almost any part of the world, North America offers breath-taking locations without the expense of international travel. The Resort at Pawsup is a luxury ranch resort situated on 37,000-acres in western Montana. With prices starting from $1,155.00 per night, this western getaway that’s bound to spoil you with the beauty of wilderness and modern luxuries falls into the “once-in-a-lifetime” category. There is an option to choose to stay in your own tent or cabin in this resort and is great for corporate getaways, family vacations and honeymoon hot spots. This glamping property is gorgeous and offers all the privacy and luxury amenities that you would want in a mountain cabin. 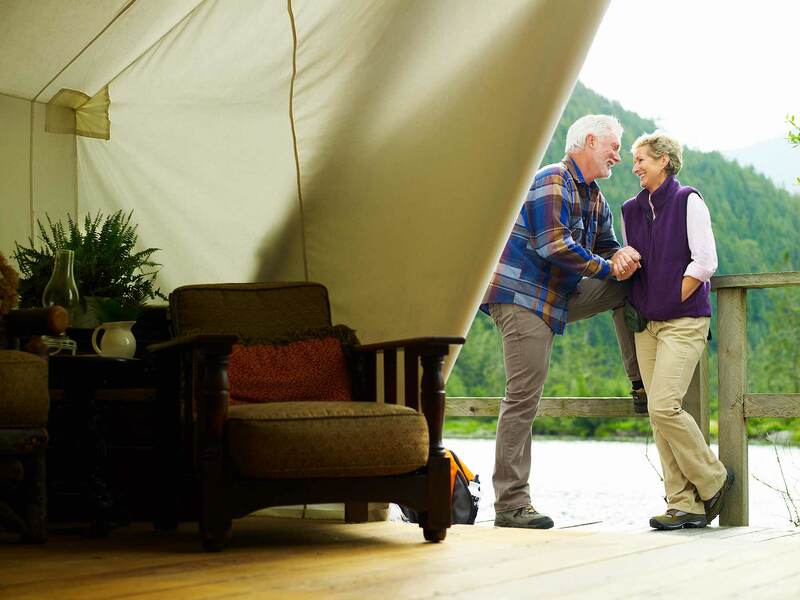 On-site activities (like hiking, massage services and sledding) and reservation based activities (waterskiing, off-road tours and fishing) are available for those who stay on the campsite. If you like the forest, mountains, ranches and luxury, Pine Mountain Camp will make a great glamp-cation for you! Wyoming a great camping destination filled with nature and wonderous scenery like no other. The best part? There are luxurious yurts you can stay in – right in the middle of Wyoming’s glory! With pricing starting from $800 per night, The Lodge and Spa at Brush Creek Ranch makes for a luxurious and once in a lifetime kind of glamping vacation. And if you’re already researching your glamping trip, click here for more destinations to choose from!